NEW DELHI: Worried about losing your identity proofs while travelling by train? Worry no more! Indian Railways have now announced that it will accept soft copies of Aadhar and driving licence provided they are in your DigiLocker, a digital storage service operated by the government that enables Indian citizens to store certain official documents on cloud. Railway Board has sent a missive to all zonal Principal Chief Commercial Managers that these two identity proofs on such service will be accepted as valid proof of identity of a passenger. “If a passenger shows Aadhaar or driving licence from the ‘issued documents’ section by logging into his DigiLocker account, the same should be considered as valid proof of identity,” it said. It has, however, clarified that the documents uploaded by the passenger himself that is the documents in the ‘uploaded documents’ section will not be considered as a valid proof of identity. As part of the Narendra Modi government’s Digital India movement, DigiLocker can currently store digital driving licences and Aadhaar. Subscribers can also integrate their PAN with DigiLocker. 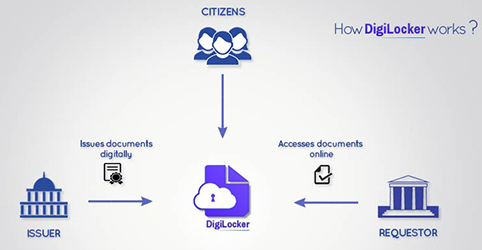 DigiLocker is a “digital locker” service operated by the Government of India that enables Indian citizens to store certain official documents on the cloud. The service is aimed towards reducing the need to carry physical documents, and is part of the government’s Digital India initiative. Targeted at the idea of paperless governance, DigiLocker is a platform for issuance and verification of documents & certificates in a digital way, thus eliminating the use of physical documents. Indian citizens who sign up for a DigiLocker account get a dedicated cloud storage space that is linked to their Aadhaar (UIDAI) number.